On the heels of his historic announcement regarding new rules limiting the emissions of power plants, President Obama has revealed another new plan to benefit the environment—this time to create the world’s largest marine sanctuary in the Pacific Ocean. 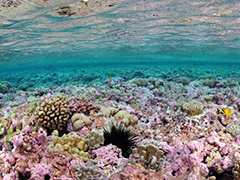 A large part of Obama’s plan involves the expansion of the existing Pacific Remote Islands Marine National Monument, which is an area in the central Pacific Ocean of over 86,000 square miles that serves as a wildlife sanctuary. The expansion would increase the size of the monument to almost nine times its current area, placing it ahead of a similar monument near Greenland as the biggest protected area of ocean in the world. With any luck, the new provisions would go into effect in the latter part of 2014, however, as the Washington Post recently chronicled, a partisan war is raging over Ocean Policy in the U.S., and Republicans may attempt to block Obama’s plan from being put into action. Aside from the sanctuary initiative, Obama plans to combat seafood fraud and black market fishing. Recent reports have indicated that a high percentage of seafood imported into the U.S. - up to 32 percent - was caught as part of illegal or unregulated fishing methods. Much of it is also mislabeled because of the lengthy process involved in getting the food out to market. While details of Obama’s initiatives are not yet available, they are expected to tackle these issues. The ecosystems contained in the expanded monument proposed by Obama are complex and include deep sea coral that have existed for thousands of years. The area also features several species of sea mammals and turtles, and is expected to not only benefit the environment, but also help drive tourism and the economy in surrounding areas. Posted on June 25th under Global Ecology.